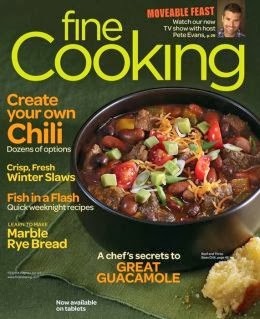 One of my favorite go-to magazines when I need a recipe that is usually delicious but also accurate in the directions is Fine Cooking Magazine. I knew immediately when I saw the cover of the Feb/March edition that I had my first recipe to test for my new blog, Recipe Realities. Heat 2 Tbs. of the oil in a heavy-duty 6-quart pot over medium-high heat until shimmering hot. Pat the beef dry, and season with 1-1/2 tsp. salt and 3/4 tsp. pepper. Cook half of the beef, undisturbed, until browned, 2 to 3 minutes. Flip and cook, turning occasionally, until well browned, 2 to 3 minutes. Transfer to a large plate. Add another 1 Tbs. oil to the pot, and brown the remaining beef; transfer to the plate along with any liquid from the pot. Add the remaining 1-1/2 Tbs. of oil, the onion, and garlic to the pot. Sprinkle with 1/2 tsp. salt and cook over medium heat, stirring occasionally, until softened and lightly browned, about 5 minutes. Stir in the poblano, bell pepper, chili powder, cumin, tomato paste, thyme, coriander, and cayenne, and cook, stirring, until fragrant, 1 to 2 minutes. Pour in the cider, turn the heat up to high, and cook, scraping the bottom of the pot to loosen any browned bits, until most of the liquid is evaporated, about 2 minutes. Add the broth and bring to a simmer. Turn the heat down to medium low. Purée 1-1/2 cups of the beans in a blender or food processor, adding a little stewing liquid as needed, and then stir the puréed beans into the stewing liquid in the pot. Return the beef, along with any accumulated juice, to the pot. Add the remaining whole beans. Cover and simmer, stirring occasionally, until the meat is tender, about 1 hour. If the chili gets too thick, thin it with a little water. Add the corn to the chili and cook until tender, about 10 minutes. Stir in the vinegar, and season with salt and pepper to taste. 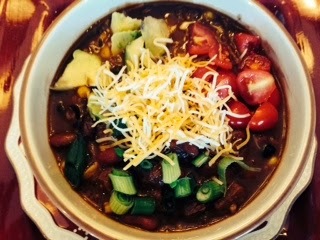 My Take: The base of this chili is amazing and you can do so many things with it but for me using sirloin instead of a ground protein or a shredded chicken or beef, make it seem more like a stew than a chili. Bottom Line: Substitute the sirloin and you have a winning recipe! ← Why the Recipe Realities Blog?